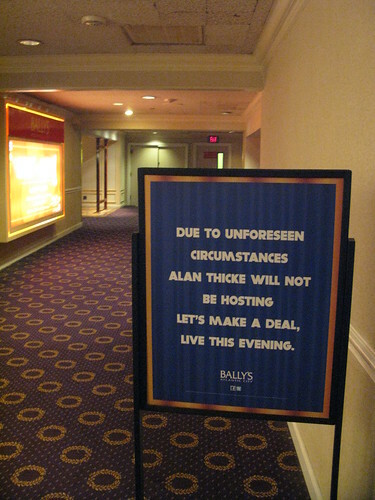 "Due to unforseen circumstances, Alan Thicke will not be hosting Let's Make a Deal Live this evening." This was just infinitely hilarious to me because years ago a friend of mine basically stalked Alan Thicke and extorted him into signing a customized hockey jersey that was customized to read "THICKE". Of course Alan Thicke was an actor, not a hockey player, so there was a brilliant non-sequitur hilarity to the fact that Alan Thicke eventually caved in and signed the hockey jersey. A truly unique piece of memorabilia.